When we started this grill review website, we had a few ideas for what a good “review” site should look like and what information it contains to help someone in the market for an appliance, but didn’t offer a buyers guide as suggested by our readers … until now. We are proud to announce our new 2019 Grill & Smoker Buyers Guide! This help you make an informed decision about buying a new grill/smoker for your home and hopefully saving you time, money and the hassle of retail shopping. 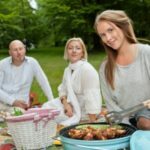 Perhaps your family had a grill when you were growing up and now you want to find out about getting one for yourself, or perhaps you and your new spouse would like to try some outdoor entertaining, or maybe you’re in the market for a great gift for someone. There are many reasons to buy a grill. There are also several excellent smokers which you might want to consider. Both types of outdoor cooking appliances have many different benefits to offer. If you aren’t sure yet what kind, size, or how complex you want or need in a grill, or in a smoker, or even which one would best suit your needs, keep reading for some detailed information that can help you decide. One of the first differences between a grill and a smoker is the purpose. What a grill does is cook food with direct heat, and smoke tends to be a bad thing, as far as grills are concerned. Smokers, on the other hand, sometimes only partially cook food by smoking it, requiring additional cooking to be done either beforehand or afterward. Bacon is a classic example of this – even though the bacon you buy in the store has been smoked, this is only for the addition of flavor, not to prepare it completely for you to eat. We wrote an article titled, The Difference Between Smoking & Grilling which goes more in-depth about this topic. After reading that post you’ll definitely get a better understanding of the different cooking methods. The smoke in a smoker produces heat, of course, but it’s more than the heat that makes the food fit for consumption. The smoke is made up of many different components, and, while most are good, a few have been known to cause health problems when someone consumes them in large amounts – much larger amounts than what the weekly smoked dinner would ever provide, that is. Two of the beneficial aspects of smoking your food is that doing so can kill any bacteria or other pathogens that might be present while other beneficial components in the smoke lend a culinary hand by giving the food a pleasant flavor. Grills also do this same feat and instead of imbuing the food with a smoky deliciousness, mark the meat with sear marks, producing a crunchy area that many people enjoy while they are eating. Grills tend to be prepared for use much more easily and quickly than smokers are, but smokers can prepare a lot more food at one time than a grill of the same size is capable of doing. Charcoal or gas, grills tend to be much quicker to heat up, and with no need to prepare the fuel prior to it being ignited in the grill. Cleaning the grill grates is very important. The fuel for a smoker, typically wood chips, pellets, or split wood, should be soaked for at least a half hour, then drained well, before using. Some experts state that soaking the wood for a longer period, especially when larger pieces of wood are intended to be used, as in the case of split logs, is crucial for a good, slow smoldering burn. Too dry and you’ve got a fire, too wet, and not drained well enough, and you’ve got a soggy mess that can start a bunch of rust inside your smoker’s burn compartment. Grills use either charcoal or a form of gas. Charcoal is very easily obtained and is fairly cheap. It can mark clothing, but the stain is rarely permanent. Before laundering, it can spread, and when on hands or fingers can taint anything touched. Keeping a damp towel close by can keep this from happening, though. Gas for a grill can be either natural or propane. 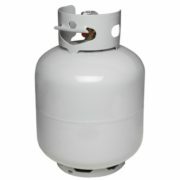 Liquid Propane (LP) can cause confusion because it has different names, and is sometimes mixed with other gases. Making sure that you have the correct type of gas can be as simple as checking the grill manufacturer’s informational specifications sheet. Smokers need freshly dampened wood that come in different forms. Fuel for smokers cannot be left damp as this will place it at risk of developing mold growth. It must be soaked only prior to being used, then allowed to dry some. 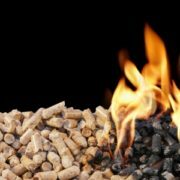 The correct form of fuel must be bought in most cases, as pellets designed for use in one type of grill may not produce the correct amount of smoke for the smoker it is being used in. This difference most likely won’t render the food inside inedible, but it can definitely change the amount of time a smoker needs to be checked and adjusted. This can take the enjoyment out of using an otherwise well-adjusted smoker. Finding a suitable location for soaking and draining the smoker’s fuel can create a significant mess. However, once this area is setup, it should not, in most cases, be a problem in the future. Grills are typically reserved for items that are larger and won’t fall through the racks’ slots. Other food items are typically wrapped in foil, such as corn, mushrooms, potatoes, mixed veggies, and the like. The heat inside a grill is fairly uniform, meaning that the introduction of these items into the grill often needs to be timed, just as it does in the kitchen. For those who plan on seriously grilling full meals, and who also want to avoid using the kitchen at the same time (who really wants to have to clean up the outside cooking area and do the same inside the house? ), a side burner can be a great investment. Having one does not cost much more and if used, it can be well-worth the slightly higher price tag. With a smoker, you can prepare food so that it ends up with a delicious extra zip to its taste, making meals much more enjoyable. Even olives can be smoked, as can small tomatoes, which make them better as garnishes, and many other items that could never be placed inside a grill. Fruit like peaches and pineapple rings can be smoked, bringing out or even increasing their sweetness. The liquid produced can be used as a glaze on ice cream, other desserts, or meat. Nuts can also be smoked, giving them a delicious aroma that is a rare treat. Whole eggs, hard boiled and then shelled are also even better when added to salads and other dishes after they’ve spent a bit of time in the smoker. But putting cheese in a grill? Big mess waiting to happen, even if it’s placed on top of other foods. So hoping that all of the cheese adequately melts after being placed on the food it’s meant to complement is about all you can really do. There’s no mess when you place it in a smoker, though. The end use is much different, true, but smoked cheese in a salad or shaved and shredded and then added on top of your food? Delectably delicious! Side Burners on a Grill – What are They Good For? Side burners were mentioned earlier, and while many people claim that they never use these parts of their grills, others say that it makes things much easier. The trick is in knowing how to put a side burner to good use for your own situation. Side burners are to complement what you are cooking on the grill. With a smoker, you can prepare an entire meal inside by adding different types of food at different times so they are all ready about the same time. With a side burner, you would use this added part of a grill like you would the kitchen stove. Instead of getting both your outside cookery dirty and the kitchen, too, you would only need to use the side burner to prepare those extra items. Plus, you would not have to do any extra running between your two kitchens, nor ruin your enjoyment with worrying about one or the other burning your food. Also, a side burner can be used with any size cookery, including a wok. A side burner can help you keep your family happy and well-fed even in the event of an ongoing power failure. This is also one of those items that larger families and groups can benefit from when on extended camping trips. While some might want to use a traditional campfire to cook certain items, having a grill with a side burner might seem like extra luggage, its inclusion can really help out when the weather turns ugly and you find that a cover for your cooking area is now a necessity. You might not find it useful to have a way to roast your food, but it is actually a very healthful way to cook meat this way. Allowing your food to turn as it is cooking creates a finished piece that is cooked more evenly than resting the same food on a surface can render. Turning your food as it cooks also keeps that food from sitting in its own fat. Liquid fat is still fat, and while a bit is great to add taste and help your body utilize fat-soluble vitamins,a substantial excess is just not beneficial to anyone except for extremely thin, underweight individuals who need the extra calories. Using a rotisserie not only gives you a greatly reduced-fat meat that is evenly and thoroughly cooked but with the fantastic taste usually reserved for special occasions or when dining at an expensive restaurant. Other appliances designed for cooking indoors but away from the stove top also exist. Electric and gas-powered smokers do not produce the smoke ring or line that many people want to imbue their ‘smoked’ food with as distinctly as a wood smoker can. The taste is also much less pronounced and in some cases, barely detectable when using a non-wood smoker, with electricity-powered ones being the worst of the two. Trading portability for taste and aesthetics may work for some people, so it is a point to be aware of. Electric grills are also designed for use in the kitchen, typically on the counter top or table, and are mainly for the looks which these can produce on meat and meat products. For a grilled look during the cold of winter, this method can often suffice. The difference in taste between this and using a grill pan is not very much, though. For those who really must have both, there are ways to convert a grill into a smoker. With a few variations made to a grill with a side burner, a smoker can be had. There are many tutorials online but it’s important to find one that is compatible with the grill you intend on converting. Some methods are permanent, and others are temporary. 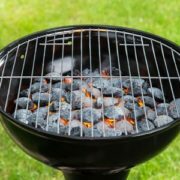 Purchasing a grill first and then making temporary alterations to it can give you insight into whether or not an investment in a smoker is something you want to pursue. Adding on to established grills or buying with additional options. 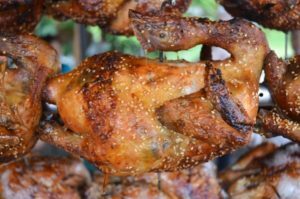 When buying a grill, deciding if having the extra features of a rotisserie or a side burner at the beginning is important before making a final purchase. Deciding later that these items are needed to get the full benefit and use of your new grill can cause the price to be higher in total than what it otherwise might have been had you decided to buy the extra feature, too. Another item that is often overlooked is a grill cover. Smokers should have one of these, as well. Being made of metal, even with heavy paint, grills and smokers exposed to the elements can begin flaking and rusting. Neither is detrimental to your cooking, but rusting can shorten the life of your grill or smoker. The cover that often is included might not be for long-term use, so finding one that is sufficient in size when making the initial purchase should be considered. The grill or smoker you buy needs to handle the amount of food you want to cook at a regular meal, plus a little more. 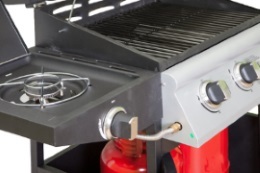 Getting a grill or smoker that is too small for your needs is going to only cause you frustration, but one that is too large can end up wasting fuel. Another thing to look at is portability. 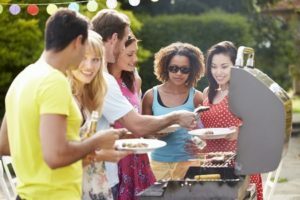 If you plan on moving soon, or going camping, to the beach, or elsewhere, including to another part of your property if you live on a larger sized lot, having wheels on your grill or smoker might be a great idea. Just make sure they are of an appropriate size. If they are too small, they might as well be non-existent. 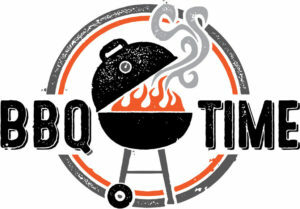 One thing that can affect which grill or smoker you decide to buy can be the cost involved and your current finances. Buying the best item you can afford will affect your ability to enjoy outdoor cooking for years to come. 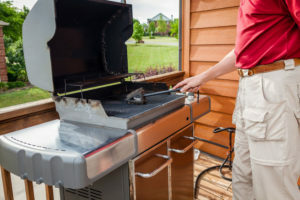 If you are a single person who wants to grill outside on occasion and will rarely want or need to smoke your food, the traditional rounded porch-style grill with lid can suit your needs to a T. Simply soak your wood a bit beforehand and close the vents and you have a smoker that can add flavor to your foods. You can then grill them without needing to even really move the food to another location. However, for those who want something more suitable for a family or group of friends, larger is not only better, it’s needed. Larger sized units often mean better, longer-lasting quality and more enduring workmanship and materials, and also a higher price. Mid-range grills and smokers can fit in well with both smaller and larger families, as well as be more affordable to more income groups than the higher-ranged items might be able to do. However, many of these might not have the same level of workmanship and require extra care in order to ensure they last as long as possible. No matter which price range you find yourself shopping in, check out the warranty information on each model you take a look at, making sure to read the exclusions list well. Also look at the length of time the warranty is good for, and how repairs are to be made. Do you need to send the unit somewhere? Is there a local repair location or will you need to pay for shipping? How long do they state that it might take to repair or replace defective or malfunctioning units? Are there any fees associated with having this done? What happens after the warranty period ends? These are some questions to ask before you pay. Checking out reviews online and paying attention to the most recent ones can help you detect problems that might not be visible on units you have become interested in. Problems that are older are often misleading for the simple fact that while at the time the review was made it might have been relevant but many companies try to learn from consumer feedback. This means that sometimes products are changed or altered to reflect customer demand, making older comments irrelevant. Happy cooking outdoors and enjoying the company of friends and family!